Elizabeth Danvers was the daughter of Sir John Danvers, 2nd Bt. She married Augustus Richard Butler, son of Brinsley Butler, 2nd Earl of Lanesborough and Lady Jane Rochfort, on 8 March 1792. She died on 10 May 1802. Sir John Danvers, 2nd Bt. He gained the title of 2nd Baronet Danvers. Child of Sir John Danvers, 2nd Bt. Brinsley Butler, 2nd Earl of Lanesborough was born on 4 March 1728. He was the son of Humphrey Butler, 1st Earl of Lanesborough and Mary Berry. He married Lady Jane Rochfort, daughter of Robert Rochfort, 1st Earl of Belvidere and Hon. Mary Molesworth, on 22 June 1754. He died on 24 January 1779 at age 50. He gained the title of 2nd Earl of Lanesborough. Lady Jane Rochfort was the daughter of Robert Rochfort, 1st Earl of Belvidere and Hon. 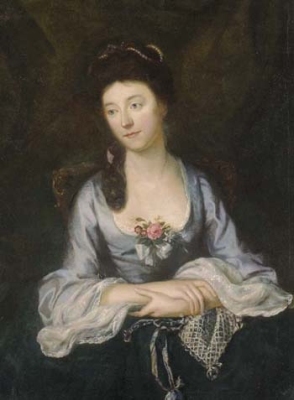 Mary Molesworth.1 She married, secondly, John King.2 She married, firstly, Brinsley Butler, 2nd Earl of Lanesborough, son of Humphrey Butler, 1st Earl of Lanesborough and Mary Berry, on 22 June 1754. She died in February 1828. Her married name became King.2 Her married name became Butler. [S6] G.E. Cokayne; with Vicary Gibbs, H.A. Doubleday, Geoffrey H. White, Duncan Warrand and Lord Howard de Walden, editors, The Complete Peerage of England, Scotland, Ireland, Great Britain and the United Kingdom, Extant, Extinct or Dormant, new ed., 13 volumes in 14 (1910-1959; reprint in 6 volumes, Gloucester, U.K.: Alan Sutton Publishing, 2000), volume II, page 115. Hereinafter cited as The Complete Peerage. [S6] Cokayne, and others, The Complete Peerage, volume II, page 114. [S6] Cokayne, and others, The Complete Peerage, volume II, page 115. George John Danvers Butler, 5th Earl of Lanesborough was born on 6 December 1794. He was the son of Augustus Richard Butler and Elizabeth Danvers. He married Francis Arabella Fremantle, daughter of Colonel Stephen Francis William Fremantle and Albinia Jane Jefferyes, on 29 August 1815.1 He married, secondly, Frederica Emma Bishop, daughter of Charles Bishop and Marianne Freemantle, on 24 November 1851 at St. George Hanover Square, London, England.2 He died on 7 July 1866 at age 71. He gained the title of 5th Earl of Lanesborough. [S6318] Colin Perry, "re: Becher Family," e-mail message to Darryl Roger LUNDY (101053), 13 August 2012. Hereinafter cited as "re: Becher Family."